The National Association of Realtors® (NAR) reported a 7.6 percent increase in existing-home sales for the month of August, to a seasonally adjusted rate of 4.13 million units anticipated in 2010. The increase was higher than many experts predicted, as real estate markets showed strong activity even without the home buyer Tax Credit. 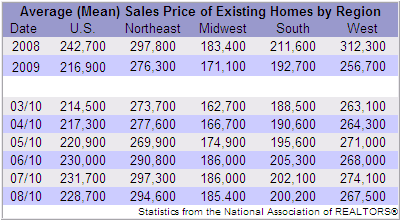 Regionally, the West showed the biggest increase in existing-home sales, with a jump of 13.8 percent. The Northeast followed with an increase of 7.9 percent, while the South and Midwest grew sales by 5.2 and 5.0 percent respectively. NAR chief economist Lawrence Yun remains cautiously optimistic. "The housing market is trying to recover on its own power without the home buyer Tax Credit," he said. "Home values have shown stabilizing trends over the past year, even as the economy shed millions of jobs, because of the home buyer tax credit stimulus. Now that the economy is adding some jobs, the housing market needs to steadily improve and eventually stand on its own." Freddie Mac reported that the average commitment rate for a 30-year fixed-rate Home Financing dropped to 4.43 percent in August, a record low. The rate was 5.19 percent during this time last year. Total housing inventory fell slightly to 3.98 million units, representing an 11.6 month supply. First time buyers accounted for 31 percent of the Homes for sale in york pa purchased during August. Investors also had a strong showing, accounting for 21 percent of the market, up from 19 percent the month before. Repeat buyers acounted for the remaining 48 percent of August home purchases. When purchasing a home, you will need to acquire homeowners insurance. In fact, all lenders will require a policy be in force prior to funding the loan. Make sure you have enough coverage, should anything happen. Policies refer to "replacement costs" that may not cover everything. You should ask your insurance agent a lot of "what if" questions. The deductible amount also plays a big part in setting your premium. Higher deductibles lower the number of claims, and reduce your insurance costs. Make it shine. Buyers are attracted to attractive Homes for sale in york pa. Make your home stand out by mowing the lawn, raking the leaves, washing windows, and cleaning the carpets. These are small things that will make a big difference. Remove clutter. Not only do clean Homes for sale in york pa show better, but tidy homes offer more to the imagination. One person's treasure is another person's trash. Removing unnecessary clutter will help potential buyers envision their own potential or the home.